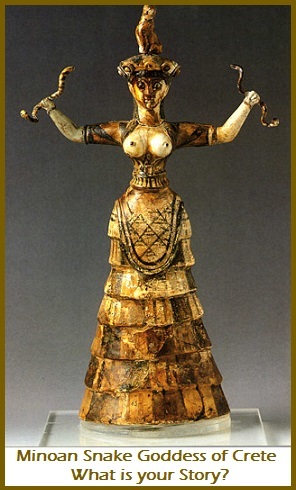 This Snake Goddess stands 11 5/8 ” tall, made of clay and was found in 1903, at Knossos (Crete), Greece; ca. 1600 BCE. Snakes in her hands and the feline on her head imply that she has power over the animal world. The exposed breasts (may allude to fertility). It is believed the Snake Goddess was extremely important in Minoan culture. The snake forms spirals with its body, and resembles the umbilicus, the life-giving cord which connects the new life with its source. Snakes are also associated with venom that could be used for medicinal and trance inducing properties. What was it like during the Minoan period living on the Island of Crete? This was a society of peace and no war. Goddesses and women were revered as the source of life. If you would like to read more about the Minoan Goddesses, I recommend Rebirth of the Goddess, by Carol P. Christ, Ph.D. Also you might be like me, and think seriously about joining Dr. Christ on her guided Goddess Pilgrimage of Crete. Maybe we would learn more about the Snake Goddess story and her wisdom.